Granuloma is a specific type of chronic inflammation characterized by the local accumulation of macrophages, epithelial cells and multinucleated giant cells surrounding with a zone of lymphocytes. What are the common granulomatous conditions? Rhinosporodiosis is a chronic granulomatous fungal infection of the nasal mucosa presenting as vascular soft polypoid mass caused by Rhinosporidium seeberi. It was first described by Seeber in Argentina in 1990. It is Endemic in Bangladesh, India, Sri Lanka, South America and Africa. Men are more suffered than female. The male female ratio is about 4:1. Infection usually results from a local traumatic inoculation with the organism. The disease progresses with the local replication of the organism and associated hyperplastic growth of host tissue. The spore of the fungas present in the cowdung of animals like cows, buffalo, dogs etc. If the people take bath in the pond or river infected with the spore they can get this infection. It is more prevalent in Winter. Eye infection can get from dust or air and more common in summer. What are the sites of Rhinosporodiosis in our body? What are the clinical features ? Sneezing, Rhinorrhea and post nasal discharge. 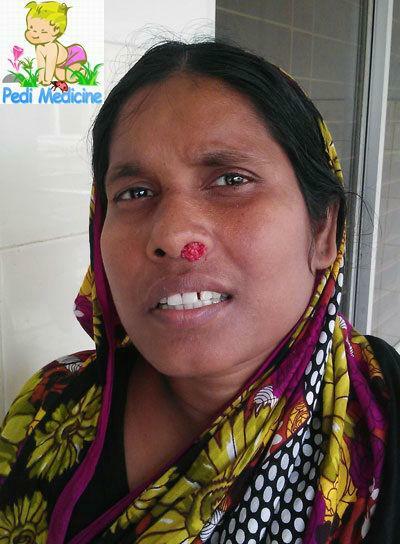 Patient may describe as foreign body being felt in the nasal passages. Reddish vascular soft polypoid mass present in the nasal cavity. Its surface is granular, looks like strawberry. It bleeds on touch. They are sessile or pedunculated. Pedicle is attached to nasal septum, inferior turbinate, lateral wall of the nose or coming from the nasopharynx. Its under surface shows grey or yellow spots of sporangia. It can be easily diagnosed by microscopic observation of the organism. Diagnosis is clinically done by observation. Swab is taken and Histopathology done after excision. The treatment of choice is Complete Excision and Electrocoagulation of its base to reduce recurrence and bleeding.